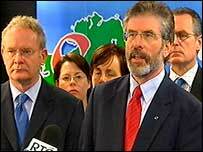 Sinn Fein president Gerry Adams has appealed to the IRA to "fully embrace and accept" peaceful means. He has given a statement to the IRA which he read out to the media in Belfast on Wednesday. I want to speak directly to the men and women of Oglaigh na hEireann, the volunteer soldiers of the Irish Republican Army. Eleven years ago, the (Irish Republican) Army leadership ordered a complete cessation of military operations. This courageous decision was in response to proposals put forward by the Sinn Fein leadership to construct a peace process, build democratic politics and achieve a lasting peace. Since then - despite many provocations and setbacks - the cessation has endured. On a number of occasions, commitments have been reneged on. These include commitments from the two governments. The most recent of these was last December when the IRA was prepared to support a comprehensive agreement. Since then, there has been a vicious campaign of vilification against republicans, driven in the main by the Irish government. There are a number of reasons for this. You asserted the legitimacy of the right of the people of this island to freedom and independence. Many of your comrades made the ultimate sacrifice. I understand fully that the IRA's most recent positive contribution to the peace process was in the context of a comprehensive agreement. But I also hold the very strong view that republicans need to lead by example. Nationalists and republicans have a confidence that will never again allow anyone to be treated as second-class citizens. Equality is our watchword. Of course, those who oppose change are not going to simply roll over. It will always be a battle a day between those who want maximum change and those who want to maintain the status quo. So, I also want to make a personal appeal to all of you - the women and men volunteers who have remained undefeated in the face of tremendous odds. It won't be easy. There are many problems to be resolved by the people of Ireland in the time ahead.